The arm must always be healthy and free from injury for archers. After all, how can one shoot bows when the arm is hurt or not functioning at its optimal? This is why it is essential for archers to invest in an arm guard to ensure that they can keep shooting steadily and safely. However, it is not enough to get any product on the shelf, as this protector should be comfortable to wear, secure and has a good fit. If you are on the lookout for one, then you may want to try one of the best on the market: the ArcheryMax Handmade Leather Arm Guard Bow Hand Shooting Glove. Just how does it fare? Before we go ahead and divulge into the features, pros, and cons of the mentioned product, let us first discuss more about arm guard in general. According to the Hamilton Angling and Hunting Association, the best arm guard fits well and offers protection on the body part that tends to hit the archer most. An arm guard is not a necessity as one can shoot arrows without it. However, for the serious archer, getting one will be a significant investment since it can prevent injuries and harm to the arm. There are two kinds of arm guards. The first one is a full-length shooting glove, which is best for those who are new to the sport as it provides greater coverage and protection. And the other one is the standard arm guard which the experienced archers opt to use. ArcheryMax is a company that specializes in archery-related products. It produces various items such as bows, target arrows, quivers, arm guards, and gloves, to name a few. And the ArcheryMax Handmade Leather Arm Guard Bow Hand Shooting Glove is one of the company’s products that were designed to protect the arm. The product maker claims that the product is made from leather. 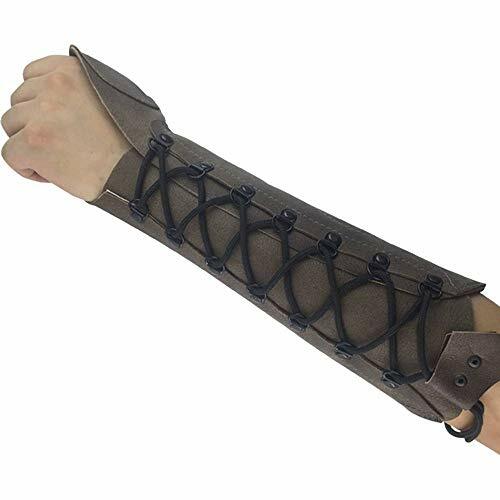 It comes in one size with the dimensions of 12.2 inch for the length and 8.7 inches for the bracer. The length is fixed while the width can be adjusted to fit one’s arm with its lacing detail. This shooting glove can fit either hand. And it comes in two variants, namely antique leather or black leather. The ArcheryMax Handmade Leather Arm Guard Bow Hand Shooting Glove is a one-size-fits-all product. It is made from faux leather which comes in either black or antique variant. This product has a laced portion so that users can adjust its width for a snug fit. This product, however, has some flaws. For one, it is not made from real leather as its material is faux leather. Plus, it tends to slide down the arms towards the hands, and then bunch up. The product maker also does not provide any guarantee or warranty. The ArcheryMax Handmade Leather Arm Guard Bow Hand Shooting Glove has many competitors. The Nachvorn Handmade Leather Arm Guard Bow Hand Shooting Glove is a highly similar product. It is also made of leather and is adjustable and handmade. Both ArcheryMax and Nachvorn’s products come in either black or brown colors. However, the latter comes with a non-slip fit that the former seems to lack. Additionally, the Nachvorn handmade leather shooting glove is also tear- and stretch-resistant. Plus, both men and women archers can use it since it is unisex. The product maker also offers a 100% satisfaction guarantee for buyers who are unhappy with the purchase. An important feature that the ArcheryMax Handmade Leather Arm Guard Bow Hand Shooting Glove does not come with. The PG1ARCHERY Archery Arm Guard for Bow Hunting is another competitor. Its product maker promises a modern, comfortable and durable shooting gloves made from superior flexible leather. The dimensions of this product are 12 inches in length and nine inches for the bracer, longer than the ArcheryMax Handmade Leather Arm Guard by few centimeters. It is also lightweight at 0.34 pounds. Like the ArcheryMax Handmade Leather Arm Guard Bow Hand Shooting Glove, this glove can fit both the left and the right hand. A feature that Nachvorn Handmade Leather Arm Guard Bow Hand Shooting Glove lacks. Moreover, the product’s width is also adjustable. But, unlike the two other brands, this one comes in several colors, namely, dark brown, light brown and black. ArcheryMax Handmade Leather Arm Guard Bow Hand Shooting Glove is a product that was designed for comfort and protection of an archer. And like any other product, it has its winning features and flaws. So, is it a great buy? Probably not, since it tends to slip off and bunch up. Plus, it only uses faux leather and only has one size. The product maker also offers no return for refund option. Those who are particular about the material and want a great fitting glove are better off finding a different shooting glove. Moreover, if you are left-handed, then the Nachvorn Handmade Leather Arm Guard Bow Hand Shooting Glove may be a winner as it is specifically made for lefties. Plus, it is also wear- and tear-resistant, adjustable, and non-slip. Not to mention, the product maker offers a satisfaction guarantee where buyers can ask for a refund when they are unhappy with the purchase. Meanwhile, if you are right-handed, then the PG1ARCHERY Archery Arm Guard for Bow Hunting might just suit you. It can be worn in either right or left hand and is adjustable. And buyers have many options for its colors as it is available in either dark brown, light brown and black.